I recently finished the very good book The Fellowship: The Literary Lives of the Inklings by Philip and Carol Zaleski. The book focuses upon four of the Inklings, C.S. Lewis, J.R.R. Tolkien, Owen Barfield and Charles Williams. But most of the book is taken up following the careers of Lewis and Tolkien. 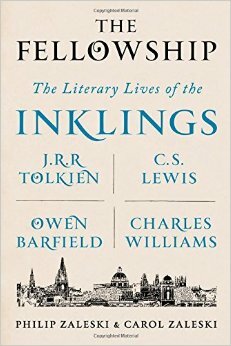 If you're interested in these authors or the Inklings generally The Fellowship is an excellent book. One of the things that struck me in reading The Fellowship is how the Zaleskis describe the literary project of the Inklings as an attempt to "reenchant" the world in the face of modernity. The Inklings did this, we know, by combining fantasy with the Christian faith. This is most obviously seen in Tolkien's books The Hobbit and The Lord of the Rings, Lewis's Narnia books and Williams's supernatural novels. The Inklings didn't write much about themselves and they never formally articulated their shared goals, but according to The Fellowship if there was a manifesto that articulated the project of the Inklings it was Tolkien's Andrew Lang lecture delivered in 1939 at the University of St Andrews. The lecture "On Fairy-Stories" was eventually published in 1947. Given that I'm interested in the project of reenchantment I thought I'd take a few posts to summarize the main points of "On Fairy-Stories" to sketch out "a theology of Faërie" and how that theology might be used in discussions about faith and belief. Beyond this theology of Faërie, let me end this introductory post by pointing out some other characteristics of the Inklings's particular attempts at reenchantment. That the Inklings used fantasy and the Christian faith to reenchant the world faith goes without saying. But their imagination wasn't just fanciful or whimsical, it was infused with both reason and morality. That's a combination that interests me, enchantment that is the product of Christian faith, imagination, reason and morality. I don't here want to adjudicate the adequacy of Lewis's famous "Liar, Lunatic or Lord?" trilemma. I simply want to note how he inserted it into a children's story, using logic as a tool of enchantment. That blend isn't unique to the Inklings, but it was a mark of the Inklings's imaginative art. We could also go to Lewis's science fiction novels to make similar observations about how Lewis used reason and science to create enchantment. Tolkien's use of reason was different from Lewis's. More than anything Tolkien was artist so he didn't go in for Lewis's analytical and logical fireworks. As we know, Tolkien's use of reason was demonstrated by his creation of a dense and comprehensive mythological world, complete with Elvish languages of his own devising. Key for Tolkien was the inner consistency of that world. Achieving that consistency, given the richness and size of the world Tolkien was creating, was one of Tolkien's great accomplishments. It was Middle-Earth's intellectual integrity and richness that made it so believable. Once again we find reason to be the engine of enchantment. In short, enchantment for the Inklings wasn't "pretend" or "make-believe," it was serious intellectual business. Everyone has heard people quarreling. Sometimes it sounds funny and sometimes it sounds merely unpleasant; but however it sounds, I believe we can learn something very important from listening to the kind of things they say. They say things like this: "How'd you like it if anyone did the same to you? "—"That's my seat, I was there first"—"Leave him alone, he isn't doing you any harm"— "Why should you shove in first? "—"Give me a bit of your orange, I gave you a bit of mine"—"Come on, you promised." People say things like that every day, educated people as well as uneducated, and children as well as grown-ups. Now what interests me about all these remarks is that the man who makes them is not merely saying that the other man's behavior does not happen to please him. He is appealing to some kind of standard of behavior which he expects the other man to know about. And the other man very seldom replies: "To hell with your standard." Nearly always he tries to make out that what he has been doing does not really go against the standard...It looks, in fact, very much as if both parties had in mind some kind of Law or Rule of fair play or decent behavior or morality or whatever you like to call it, about which they really agreed. These infusions of reason and morality into the fantasy of the Inklings won't be featured when we turn to "On Fairy-Stories" in the coming posts, but I did want to mention these characteristics here at the start as it's this combination of imagination, reason, morality and Christianity that gave the enchantments of the Inklings their distinctive and peculiar quality. "But do you really mean, Sir," said Peter, "that there could be other worlds--all over the place, just round the corner--like that?"